We still have a lot of old forest in biodiversity-rich southwest Nova Scotia… will we decide in 2018 to keep it that way? My wish for the New Year: the Independent Review surprises me, and comes out with strong recommendations to protect our remaining older forests, allowing only selective cutting (if any); then the Premier and his government surprise us all by accepting the recommendations; and then the big forestry companies accept the challenge and fundamentally change the way they operate, benefitting all Nova Scotians and our wildlife and for seven generations of the same. (Chronicle Herald,Business Dec 14, 2017) have been forthcoming. Gary Saunders, in his opinion article “Stop mourning yesterday’s forests,” Dec. 14, makes the assumption that “all the mourners” at the Forest Funeral wished the forests of Nova Scotia to return to the state they were 400 years ago. ..the inhumanity of clearcutting is that it created wildlife refugees because these individuals cannot just move elsewhere to live. Maybe, more importantly, with the loss of large diameter deadwood of different species, myriad beetles and other invertebrates, many not discovered yet, lose their habitats and may die off. The other sad result of present forestry practices in Nova Scotia is that jobs that used to exist, supported by forest resources, are disappearing. by Soren Bondrup-Nielsen in Voice of the People, Chronicle Herald, , Dec 23, 2017. Regarding the Gary Saunders opinion piece in the Dec. 15 business section, suggesting that we should all “stop mourning yesterday’s forests,” I’d like to offer a different perspective on the perils of clear-cutting — a quick math lesson, if you will. He goes on to estimate that “for every year since just 1990, about two million tonnes of sequestered CO2 has been removed from Nova Scotia’s forests, overwhelmingly by means of clearcutting”. That’s a significant amount, equivalent to about 11% of Nova Scotians annual GHG emissions. I am sure the defenders of Nova Scotia’s forest practices will be quick to point out that P.R. 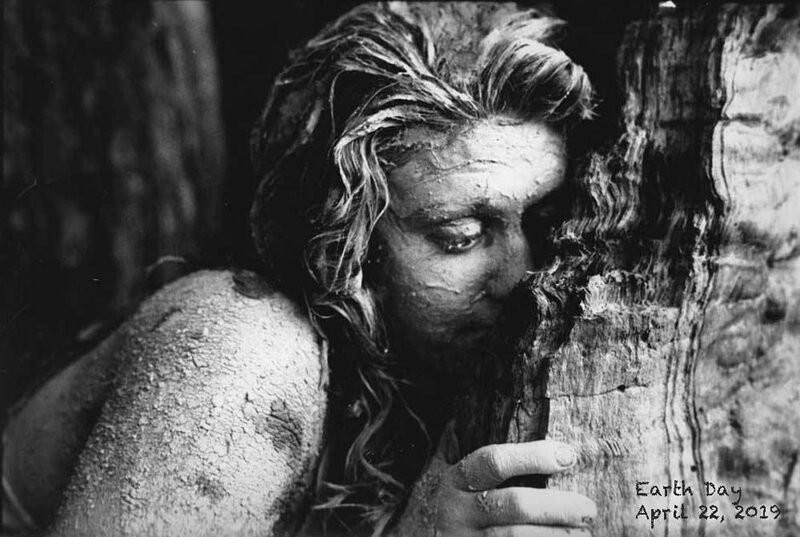 did not mention uptake of carbon by the forests growing up in clearcuts, or the storage of carbon in lumber. However, on the other side neither did he mention the losses from soil which can be of similar magnitude to carbon removed in the trees, and take longer to recover – up to 100 years. I guess the point is that however you look at it, the removal of stored carbon when we clearcut our forests is very substantial and we need to begin to consider that in our evaluations of sustainability of forest harvesting in Nova Scotia, and in our GHG accounting. If I have one major bone to pick with Saunders’ perspective, it relates to his contention that we have already cashed in the Acadian forest of old. Mother Nature’s new forest differs from the old. In place of massive shade-loving beech, maple and hemlock, she sent in sun-loving pin cherry, birch and aspen. These, in turn, fostered longer-lived white spruce, balsam fir and, in our western counties, white pine. Later, these over-topped their nurse trees and shaded them out. The result? Wide swaths of shade-tolerant, multi-species Acadian trees got replaced by even-aged, same-size softwood stands — a pulpwood forest. Called forest succession, it’s perfectly normal. And, says Sanders, it’s really hard to reverse that, citing his own attempts on a 25 acre woodlot. 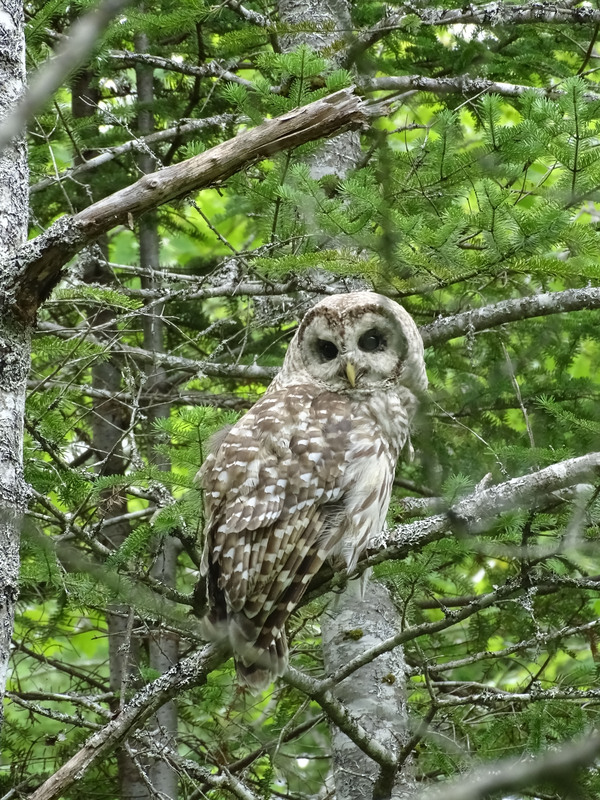 Barred Owl in proposed Shingle Lake Nature Reserve in southwest NS July 29, 2017. Clearcuts are scheduled nearby. But give WestFor a free hand in the southwest, our last great wood basket and the area of our greatest biodiversity, and in 10 years we will transform those remaining areas to the dire picture Saunders talks about, the picture that exists in the northeast and central part of the province and much of Cape Breton. It could be even worse as the soils of the southwest are highly depleted due the combination of acid rain and inherently poor soils. And it’s not a continuous cover of old forest but rather many patches, so it won’t take much clearcutting/even-aged management combined with DNR’s lack of landscape level planning to disrupt critical wildlife corridors between patches of old forest in southwest Nova Scotia. So my wish for the New Year: the Independent Review surprises me, and comes out with strong recommendations to protect our remaining older forests, allowing only selective cutting (if any); then the Premier and his government surprise us all by accepting the recommendations; and then the big forestry companies accept the challenge and fundamentally change the way they operate. benefitting all Nova Scotians and our wildlife and for seven generations of the same. This entry was posted in Acadian Forest, clearcuts, Conservation, Letters&Editorials, WestFor. Bookmark the permalink.